All good poker players are constantly on the lookout for ways to get an edge over whoever they are up against at a table, whether this is online or not. There are a ton of tricks and tactics you can use to increase your odds of winning more hands and money, and in this article, the one we will take a look at is the poker squeeze play. This tactic works hand in hand with opponent knowledge – knowing the characteristics and betting patterns of your opponent’s, and when combined well these poker moves can help you win a whole lot of cash. What is Poker Squeeze Play? This play gets made before the flop after someone you have identified as a loose player raises the pot, and who is then followed by at least one, but maybe more players who have decided to call rather than raise. Then (almost despite your hand) you make a big three-bet in order to scare the remaining players into folding. To put it simply the poker squeeze play is a preflop bluff, and when executed properly has the potential for effectively upping your win rate and leading to more money in your pocket. When pulling this online poker strategy out of your bag of tricks to win a hand, how likely it is to work depends a lot on how well you have recognised the playing style of the others at the table. The optimal thing you want to see is players that open the raise far too often and too aggressively, combined with players that are more likely to call rather than raise. The reason the poker squeeze is ideal in this situation is down to the fact that the aggressive opening raiser is likely to openly raise whether or not they are actually holding good or bad cards and the passive players are then statistically likely to follow this up with a call regardless of what they are holding. This reveals that if their cards were better then they probably would’ve raised instead of called. This game scenario then leaves these players open to a big three-bet that their cards don’t justify calling and can lead the weaker card holding players to all fold. Like all poker tricks and tactics, they need to be tailored and adjusted to the individuals you find yourself up against. Their different styles of play and betting patterns will determine how big your three-bet should be. Having said that though we need to start somewhere so here are a couple of suggestions to start adapting your strategy. Make your three-bet at least four times the first bet if you are playing against a raise and only one other call. Make your bet at least five times the first bet if there are two calls. Some players hate to fold and if you have identified this then you can adjust when you apply the poker squeeze by widening your value range to counter it. Following on from this, some players hate to fold but then again some players will naturally fold when up against a big three-bet. Try to identify which edge of this spectrum your opponents fall nearest to as quickly as possible to increase the success rate of a poker squeeze. If you are up against a calling station (someone who always calls and rarely if ever raises) then these players are ideal for the poker squeeze and a ton of money can be made off these sorts of opponents in this situation. Look out for opponents who are tight, whom you have noticed pack in and fold easily and often. If there are players like this then it can be profitable to bluff even more when squeezing them and play a more aggressive style. 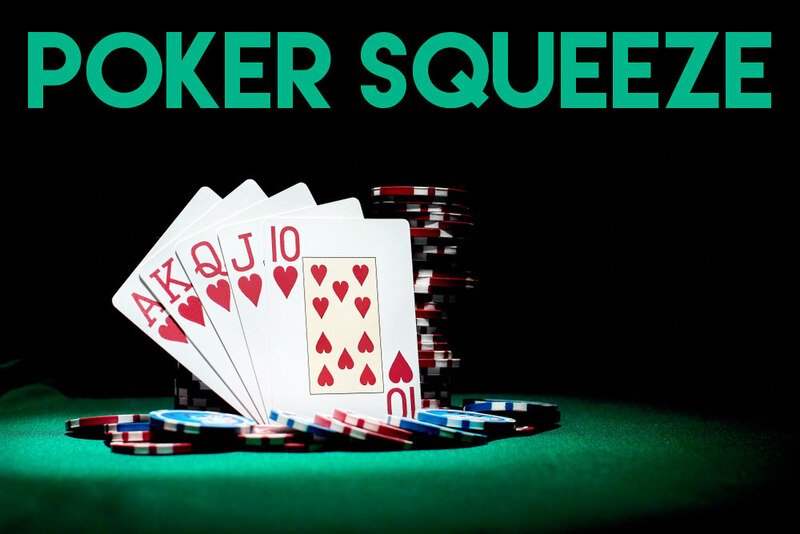 Now that you have had a taste of what the poker squeeze is it’s time to put it into action in your games. Do keep in mind that like everything else in poker there are no guarantees that it is always going to work. It’s all about using whatever tools you can develop to find edges over your competitors and finding weak spots in their play. With that in mind if you can develop your poker squeeze technique well then you will find it can help increase your win rate and profit line.